Logo design is one of the most important aspects of launching a business’s brand. It’s the face of the company, and graphic designers are tasked with creating logos that are both captivating to potential customers, as well as informative of the business. Here, three leading graphic design companies discuss their experiences creating logos for local and national businesses. Graphic designers work on a broad range of marketing campaigns for businesses. But perhaps the most high stakes part of a designer’s job is creating logos for their client. A good logo will represent their brand, captivate potential clients, and communicate the business’s goals. That’s a lot of impact from one little image. A good logo does a lot of work. And a good designer ensures they design with the business in mind. “Excellent branding remains the cornerstone of any good marketing strategy,” says Clare Richards, Creative Services Manager at Leighton Interactive, a marketing agency operating out of St. Cloud, Minnesota. Logos are the key to any brand strategy, and designers are tasked with finding the perfect foundation for a company’s marketing campaign. “You need a logo that gives as much information as possible through a visual aid. A potential customer should be able to look at a logo and find it appealing, not distracting,” says Cassy Roop, owner of Pink Ink Designs. These technology focused logos from Canva, White with Padlock Icon Computer Logo and Modern Telecommunications Logo can help give you an edge over your competitors. Most importantly, the logo needs to successfully stand on its own on every platform, including websites, social media, print material, and more. However, it still needs to be a cohesive part of the brand strategy as a whole, working with other components of the marketing done by the business. “It needs to be powerful enough to stand on its own but work well within other brand pieces,” says Richards. So how, exactly, can you create a logo that incorporates all those needs? A logo’s most important task is communicating the business—its purpose and its personality. Matching a logo design to the type of business it’s for is an important task for any designer. Recognition is a key component in a visual aid. “A logo should be automatically associated with that brand when seen by potential customers, recognized by it even,” Roop says. Building a design around factors that capture a customer’s eye will not only help the business gain customers, but help the designer sell the logo to the client. The colors and stylistic elements used in a logo need to capture the client’s desires, the business type, and the target audience. Making the correct decisions on color, typography, shape, and more can be the make-it or break-it components to a design. Easy-to-customize logos, like Grey Circle Leaves Floral Logo and Charcoal Square Hipster Logo can be found on Canva. Every designer and design firm has their own unique process for how they design a logo. But evem factoring in all those differences, it breaks down into four simple categories: Listening, Gathering, Designing, and Editing. Understanding the business is the most essential part to the design process when it comes to creating on-brand logos. “It is difficult to sell the idea of a logo to a company when all the logo represents is a vague idea, or just a random combination of shapes, fonts, and colors,” says Oliveira. Richards agrees. “Our design process for logo creation changes based on client need, but always starts with foundational digging.” She explains this involves an in-depth discovery session to uncover what the client wants to achieve, what resonates with the client’s target audience, and specifically understanding what the business is about. She also clarifies that in these scenarios, a designer can learn what a client needs through other avenues as well. “I will look through a client’s website and social media to get an idea of their likes and dislikes. I look at their products and then the design will pair with the theme of who they are.” This particularly makes sense with clients who struggle to verbalize their needs. Their online presence is another way to gain insights about their personal style; it’s another way of listening to what the client wants. But whether the client has a strong concept in place ready to go, or they’re completely unsure of what they’d like, the designer needs to be able to listen to their needs and the needs of the client’s customers to be able to determine the best direction. Bring attention to your business through your logo by customizing the Neat Restaurant Logo and Black and White Bordered Band Logo. Not only is it important to research what’s already out there, but it’s important in this phase to gather inspiration. “All ideas are welcome,” Oliveira describes the brainstorming part of his design process as one of the most important. He goes on to describe it as a team-wide collaboration that utilizes the best ideas from each member and combines it into an amazing end result. Inspiration isn’t all research, either: it can be found in everyday places. Roop finds inspiration in music, movies, quotes, and other images. “It would be easier to list things that don’t inspire me,” she says. She also emphasizes the importance of combing through the client’s personal and professional websites and social media to be ‘inspired’ by who the client is and what their tastes are. Fully prepared with the market research and a comprehensive understanding of the client’s wants, it’s finally time to actually create the product, or, more accurately, products. Designers often prepare several logo options to present to the client, which can be similar with small variations, or vastly different concepts. Richards describes color as a variable part of the design that can be represented in the final proofs. “Include variations of the logo to showcase—one color, two colors, black and white, etc.,” she says. Showing these examples to the client can help them imagine what their logo will look like in several different scenarios. Armed with the perfect designs and a lot of market research to fall back on, the designer’s last and final step is to present their ideas to the client and then make the edits requested. This part of the process can be a hit to a designer’s ego if they are more emotionally tied to their creation than to the client’s happiness. Editing and receiving feedback is a necessary part of the process and is what will finally narrow down the options to the final logo that that client will utilize going forward to represent their brand and business. “The final step is presenting the logo and receiving feedback. While we’ve had to revamp logos before, clients are often satisfied with our logos because they are based on data and research,” Richards says. She continues to detail that if the first steps in the process are followed, then it’s less likely that there will be a lot of revisions after the fact. Sometimes it’s not just about the final product, but also how the designer presents it to the client. “We carefully create a presentation that will detail every part of the creative process, from understanding the business to the final design, so our customers can travel through the process with us,” Oliveira says. Making the client feel valued and understand why each decision was made can create a comfort and confidence every client needs to feel in their logo design. These striking black and white logos can bring in more business: Black and White Bordered Band Logo, Black and Cream Strikethrough Band Logo, Black and White Bordered Band Logo, and Black and White Boxed Band Logo. “Listen, learn, plan, and then over deliver,” Oliveira recommends to any new designers. Going above and beyond for every client, making them feel heard, and doing the research needed to execute an on-brand logo design is always going to be the way to deliver a design that will make your client thrilled. 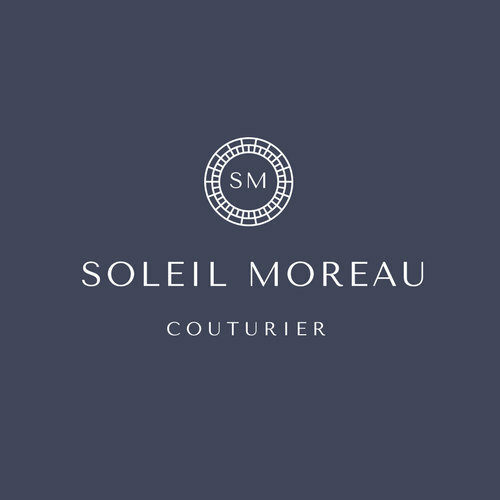 These fashion-themed logos can bring your brand to the forefront: The Lima Fashion Logo and Soleil Moreau Couturier. The most important part of any design is the relationship between a designer and their client. When this breaks down, that is when mistakes are made. “It’s a learning process,” Roop says. “Miscommunication is a big factor in making mistakes.” Picking up from those mishaps, learning from them, and repairing the problem is what can keep a client from going to another designer. Utilizing these design tips and the comprehensive four step process to designing logos will enable graphic designers to create the perfect logo for any client.